A dcs file extension is related to the Kodak RAW image file format used by Kodak DCS. The dcs file extension is associated with the KODAK DCS (Digital Camera System) a device used to create digital photos from SLR (single-lens reflex) cameras (from Nikon, or Canon) for 35mm camera film. The dcs file stores RAW image captured by KODAK DCS device. Kodak DCS is obsolete product discontinued in 2005. Kodak Photodesk is an older digital photo management software from Kodak. Still available, but probably heavily outdate for todays standards. Use Kodak Photodesk to open *.dcs files. Click on the tab below to simply browse between the application actions, to quickly get a list of recommended software, which is able to perform the specified software action, such as opening, editing or converting dcs files. Programs supporting the exension dcs on the main platforms Windows, Mac, Linux or mobile. 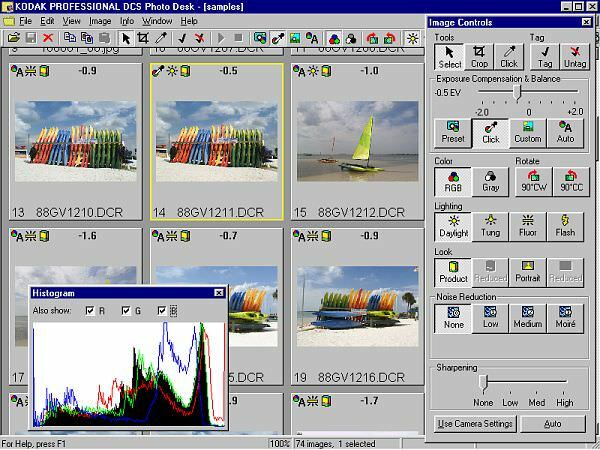 Click on the link to get more information about Kodak Photodesk for view dcs file action. Programs supporting the exension dcs on the main platforms Windows, Mac, Linux or mobile. Click on the link to get more information about Kodak Photodesk for convert dcs file action. Programs supporting the exension dcs on the main platforms Windows, Mac, Linux or mobile. Click on the link to get more information about BatchPhoto for import dcs file action.